Kate thought that once her mother died, the pain she had caused would end. Then she discovered that a letter had been sent to a prominent television presenter on her mother’s orders taunting him with the fact that Kate now held photographs which would ruin him and probably lead to his arrest. Suddenly Kate is running for her life. She seeks help from Rob, a much older man whom she has only known for a very short time. DW: I am a father of three sons, two of them still living at home, one married with sons of his own. I was a mental health community counsellor for many years and met a lot of interesting people from the sad and lonely to the plain dangerous. I honed my writing skills in this job, devising self-help books and booklets, often for people who didn’t read from choice and ‘tweaking’ them with field tests. DW: Almost as soon as I could read. 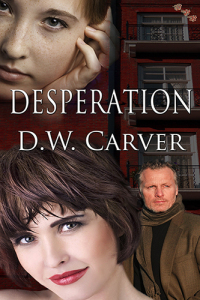 DW: This is ‘Desperation’ published by frontPorch. It is about a young woman who finds that her recently deceased mother, had arranged for a letter to be sent on her death that will put Kate (the young woman) in danger from a media celebrity who has gang connections. DW: My heroines are usually flawed but strong willed and I wanted to explore the ways Kate would deal with a life threatening situation when she had no experience of being able to trust people. DW: My favourite at the moment is ‘The Memory Plot’, third in my ‘Jill Garvin’ series. Jill realises in this that her remembered life was mostly a lie. (She lost a lot of memories after the road crash deaths of her husband and daughter and is gradually getting them back). This is another projection from my time as a counsellor. I met a lot of people who had ‘swallowed’ someone else’s strange philosophy of life (often a parent)and had to reinvent themselves. DW: Sarah, Jill Garvin’s step-niece. She has been abandoned by her mother and step-father, feels unloved and unlovable and struggles to find her place in life. In this series she ages from sixteen to twenty-two and sometimes Sarah feels like the daughter I never had. DW: Bearing in mind that what is normal to a European audience, often isn’t to one in North America. I have sometimes been surprised when editors and/or publishers are shocked by content that might have been a regular occurrence in my working life. DW: To keep writing. It’s what I do. DW: A seventh Jill Garvin novel. I’d say it’s in the planning stage but to be honest I only really start to build my story once I’m in front of a keyboard. DW: Be prepared for rejection – lots and lots of rejection.